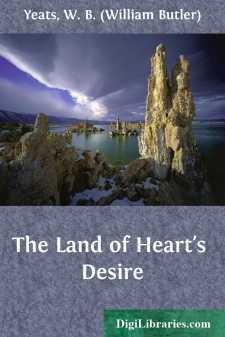 THE LAND OF HEART'S DESIRE SCENE.—A room with a hearth on the floor in the middle of a deep alcove to the Right. There are benches in the alcove and a table; and a crucifix on the wall. The alcove is full of a glow of light from the fire. There is an open door facing the audience to the Left, and to the left of this a bench. Through the door one can see the forest. It is night, but the moon or a late sunset glimmers through the trees and carries the eye far off into a vague, mysterious World. BRIDGET. Because I bid her clean the pots for supperShe took that old book down out of the thatch;She has been doubled over it ever since.We should be deafened by her groans and moansHad she to work as some do, Father Hart;Get up at dawn like me and mend and scour;Or ride abroad in the boisterous night like you,The pyx and blessed bread under your arm. BRIDGET. You've married her,And fear to vex her and so take her part. MAURTEEN (to FATHER HART)It is but right that youth should side with youthShe quarrels with my wife a bit at times,And is too deep just now in the old bookBut do not blame her greatly; she will growAs quiet as a puff-ball in a treeWhen but the moons of marriage dawn and dieFor half a score of times. FATHER HART. Their hearts are wild,As be the hearts of birds, till children come. BRIDGET. She would not mind the kettle, milk the cow,Or even lay the knives and spread the cloth. MAURTEEN. Shawn, this is half empty;Go, bring up the best bottle that we have. FATHER HART. I never saw her read a book before,What can it be? MAURTEEN (to SHAWN)What are you waiting for?You must not shake it when you draw the corkit's precious wine, so take your time about it. (To priest) There was a Spaniard wrecked at Ocris Head,When I was young, and I have still some bottles.He cannot bear to hear her blamed; the bookHas lain up in the thatch these fifty years;My father told me my grandfather wrote it,And killed a heifer for the binding of it—But supper's spread, and we can talk and eat.It was little good he got out of the book,Because it filled his house with rambling fiddlers,And rambling ballad-makers and the like.The griddle-bread is there in front of you.Colleen, what is the wonder in that book,That you must leave the bread to cool? Had IOr had my father read or written booksThere was no stocking stuffed with yellow guineasTo come when I am dead to Shawn and you. FATHER HART. You should not fill your head with foolish dreams.What are you reading?